When you are in a work environment with different computers, one of the problems that tends to arise frequently is that you can't remember the specifications of each of the computers that are available. To avoid this you can use BGInfo. 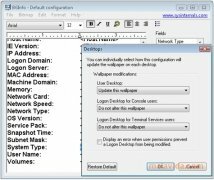 This small application, that doesn't require installation, offers a quick solution to the problem, since it allows you to show system specific data on the desktop wallpaper. You will only have to launch BGInfo and select the data that you want to have visible and apply the changes to have all the information. One of the best things about BGInfo is that you will have the possibility to choose where you want to place the information on the wallpaper as well as the chance to change the color of specific data to make it stand out more than the rest. 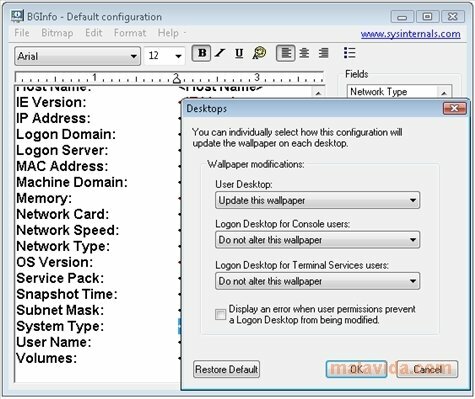 Therefore, if you want to be able to access to the vital information of a computer very quickly, download BGInfo as soon as possible.